Valentine’s Day is just around the corner, but not everyone is looking forward to its arrival. I personally am not a huge fan of all the pink, red, glitter and giant stuffed animal clutching fluffy hearts with embroidered messages of undying love. Indulge your own bitter heart with these gothic valentines cookies to mark the day, Miss Havisham style. Put on your old wedding dress and eat these in your decaying mansion. They will be a lot tastier than your dusty old wedding cake, all the time being careful to stay away from naked flames. Rollable fondant icing to decorate. A little icing sugar and water mixed together to make a paste. Preheat the oven to 150*C/300*F/ gas mark 3. Line a baking sheet with baking parchment paper. Set aside. Cream together the butter and brown sugar until light and fluffy. Beat in the golden syrup until smooth. Whisk the flour, cocoa powder, salt and soda together in a beaker. Sift this into the creamed mixture. Add the milk a bit at a time, until you get a soft even dough. It should be a bit crumbly, but be just coming together. Tip out onto a lightly floured surface or onto a large piece of cling film and press until it comes completely together. Roll out with a lightly floured rolling pin about 1/4 inch thick. (I rolled mine out between two sheets of cling film so that I did not have to use a lot of flour.) Cut out into shapes, heart or others. Carefully lift onto the prepared baking sheet with a metal spatula, leaving some space in between the biscuits. Bake for 8 to 10 minutes, then remove from the oven. Carefully lift onto a wire rack to cool completely. Roll out the fondant icing very thinly and cut into similar, slightly smaller piece of fondant icing. 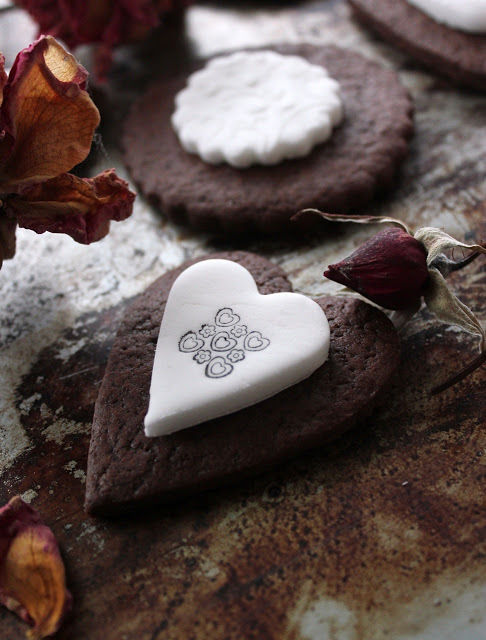 Stick the fondant to the biscuit with the icing sugar paste and leave to dry. 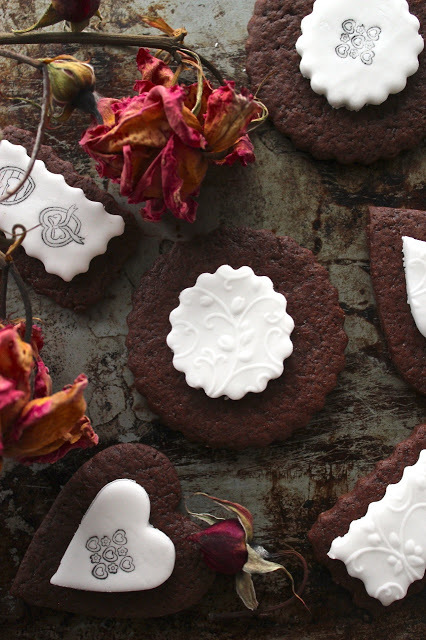 Paint, stencil or stamp cold, black hearts onto each cookie or decorate as desired. Fester in your own unhappiness or plot your revenge, while enjoying the biscuits with a nice cup of tea. I love your sense of humour, Anne Marie! I too am not a fan of Valentine’s Day and stuffed animals. You’re a girl after my own bitter heart. As if I still fit into my wedding dress! i love the name of these cookies! they are pretty! These are creative and beautiful! Classy and elegant! 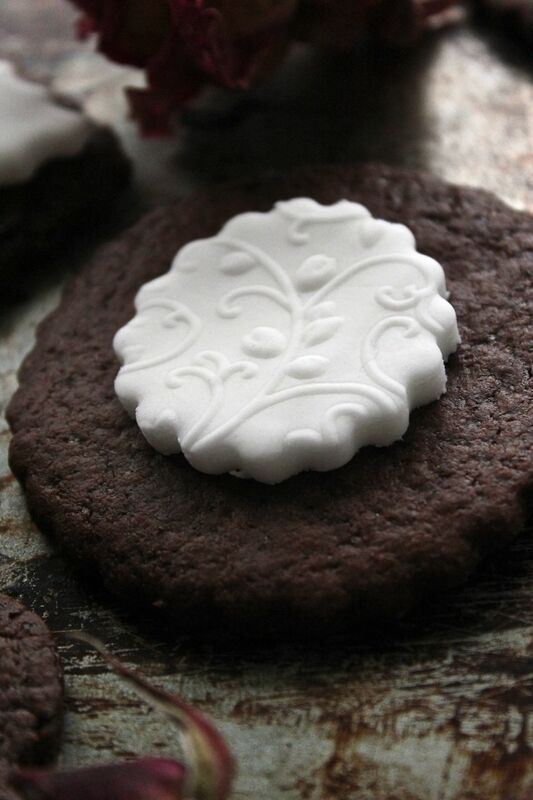 I’ve never seen fondant decorated like that with texture on a cookie and am eager to learn how to do this! 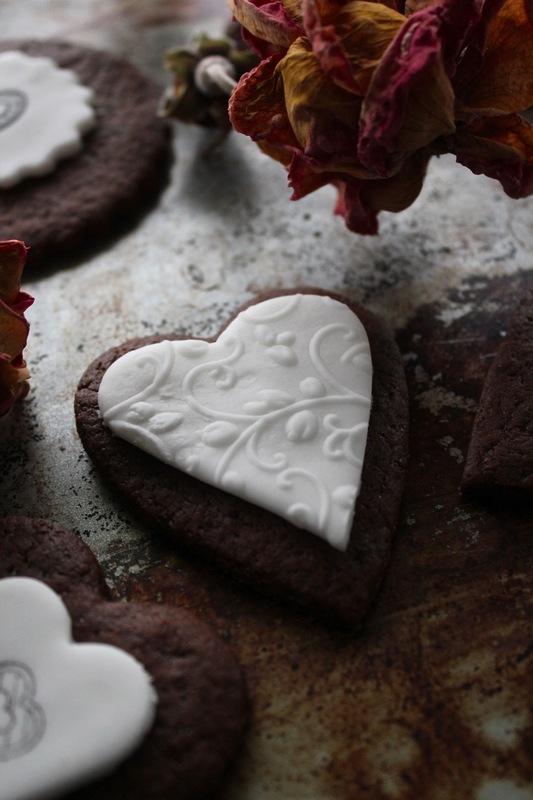 Perfect cookies for making for loved ones as valentines! Anne Marie, I love your blog and featured it on my blog today!